It's been a long time since ex-Cucumbers singer Deena Shoskes released her last album, Somewhere In Blue, back in early 2009, but she's clearly been accumulating some strong material in the interim period. Rock River opens with the jaunty sounding My Own Advice. For those of you who like Deena's more up-tempo numbers then you'll want to hear the bold and brassy sounding My Friend Superman and the bluesy All She Wrote which features some Steve Nieve-like keyboards. 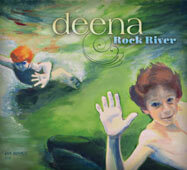 I've always preferred Deena's slower numbers, however, and this is once again the case on Rock River. I'm not exactly a major Country & Western fan by any means – indeed there was a time when I'd have run a mile just at the sight of a pedal steel guitar! – but Deena really hits the mark with songs like Bring It All, I Will Never Be Your Valentine, and Always Tomorrow. When married to her yearning voice, Deena's songs are so ideally suited to a C&W medium that I'm started to think she should make the move to Nashville and show them how it's done (and hopefully make a few bucks at the same time!). Elsewhere, Comes With Kisses mixes an almost baroque feel with a gorgeous chorus that brings to mind The Bangles whilst Mr. Nobody benefits from some rather soulie organ sounds. Find The Love, meanwhile, has a nice airy feeling where its ethereal sounding keyboard is interrupted by some guitar stabs. But as was the case with Somewhere In Blue, where Deena closed the album with the exquisite Goodbye Dreamer (probably her finest song in my opinion), she saves the best until last. When I Fall is another country-ish song with a beautifully melodic chorus where Deena's voice is at her very best before a tasty pedal steel solo (yes, really!) bursts in halfway through. It really is lovely – and for a song entitled When I Fall it really is rather uplifting.